"Numerical Modeling of Exoplanetary Atmospheres"
"Your Place in the Universe: Understanding our Big, Messy Existence (talk, booksigning event)"
"Galaxy Formation in the Universe: the Beginning"
Cheryl Smith of Columbia gets a good look at Mars through a telescope at the University of Maryland Observatory. Not many 9-year-olds would choose the University of Maryland Observatory as the site of their birthday celebration, but Kate Coppess thought it was the perfect place for a prelude to a sleepover party. The fourth-grader from College Park and six of her friends spent a September Saturday night listening to a lecture titled "Galaxies, Black Holes and Gravitational Waves" and then looking through telescopes at Mars. 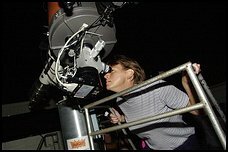 For 30 years, the school's Department of Astronomy has hosted free open houses that combine a lecture with stargazing (weather permitting) on the fifth and 20th day of each month. Lately, the open houses have been extremely popular because of Mars's close position to the Earth this fall, so even the birthday girl had to stand in a long line to see what turned out to be, in her words, just a "big orange blur." She thought its blob-like appearance was because she was too far away. As her parents held the girls' place in line, Kate and her friends made up a game that they played well into the night. "We pretended we were black holes and were bumping into each other, like galaxies colliding," Kate said. As they waved their arms in the air and glided around one another, the youngsters unknowingly demonstrated that they had grasped the concept that when galaxies collide, they don't exactly run head first into each other. Instead, lecturer and astronomy professor Cole Miller explained with the help of visual props -- including magic tricks and a movie -- that gases waft together and integrate with one another without a big impact. Although most people at the observatory's open-house lectures are not children, the half-hour discussions are about topics that can be simplified for a general audience. The purpose of the open houses is to teach community members about astronomy and allow them to use the observatory's telescopes to look at celestial objects. "We know that some people come just to observe, but we encourage people to come for the lectures, too," said Elizabeth Warner, coordinator of the biweekly events. Warner said large crowds of a few hundred people have shown up at recent open houses to view Mars, compared with the usual attendance of fewer than 100. The red planet was closest to Earth in late August, but it will remain highly visible through December. Recently, because of long lines for the telescopes aimed at Mars, people have lingered at the observatory well past the bedtime of children like Kate. Warner tries to make sure people go home by midnight, especially when the open houses fall on weekday nights. Luckily, Kate lives close enough that she can pop in on a clear night, when her father, Jim, suggests that they go. He heard about the open houses a few years ago and has taken both of his daughters to them from time to time because of their interest in astronomy. "I go because my kids are interested in it, but I find it interesting also and I'm not an astronomer," Coppess said. "I would think anybody would like it because you can look up at the stars, which is something you can do without much preparation." Daughter Kate likes to go to the observatory very much, especially since she did a school project about life on Mars two years ago. She said she wants to be an astronomer when she grows up because space is "interesting" and "cool." Those are the same words she used to describe what her friends thought of her birthday party. The next open house at the University of Maryland's observatory begins at 9 p.m. Sunday. Faculty research associate Stef McLaughlin will give a lecture, "Extrasolar Planets." The Department of Astronomy hosts free open houses on the 5th and 20th of every month. Lectures will proceed even if weather does not permit viewing of celestial objects. The observatory is on Metzerott Road between Adelphi Road and University Boulevard in College Park. For information, call 301-405-6555 or visit www.astro.umd.edu/openhouse.